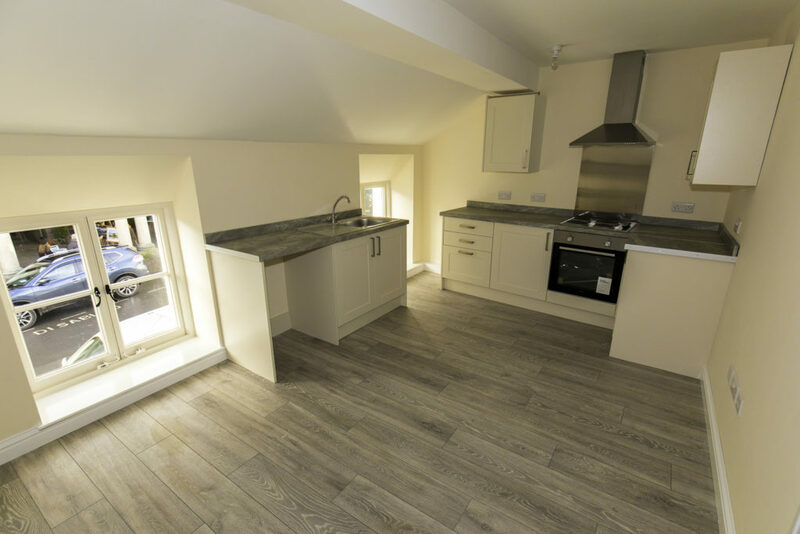 Rent our one-bed flat in the Sunday Times’ 2019 Best Place to Live, above the 2018 Best High Street in Britain. It’s in The Corn Exchange – at the heart of Crickhowell’s remarkable success story. Our Managing Director, Dean Christy​ represented Crickhowell at the Saint David’s Day Reception in Downing Street. He met the Prime Minister and The Welsh Secretary and spread the word about the town’s achievements with The Corn Exchange, the Great British High Street campaign and now The Clarence Hall project. We are delighted to say that we have received 12 applications for funding from the £15,000 Great British High Street Prize Fund. Altogether, these amount to nearly £52,000. BUSINESS AMBASSADOR – CRIC – approx. £3,500. A paid post working with and on behalf of the town’s businesses to promote the town across digital and non-digital media. To think strategically and identify opportunities for cross-promotion. To build on the ‘team Crickhowell’ ethos developed during the GBHS campaign and work with Crickhowell Volunteer Bureau, the local Litter Picking Groups, Rotary Club and other groups to develop a volunteer team to identify and carry out regular town clear-up/maintenance activities. 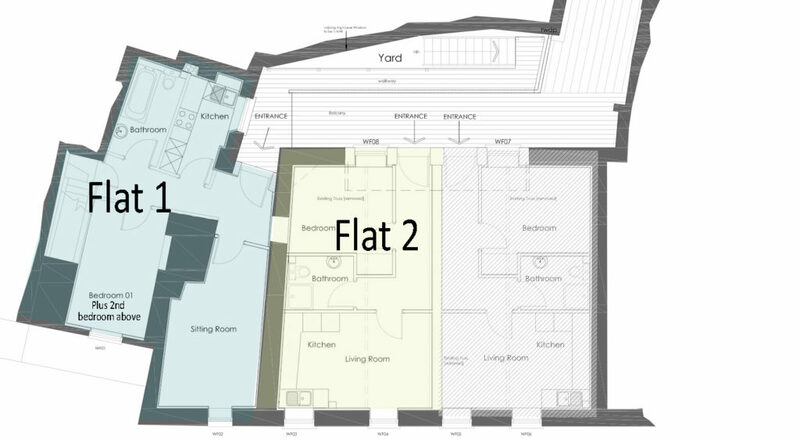 CLARENCE HALL AUDIO VISUAL UPGRADE – Clarence Hall – £2,350. To contribute to the ongoing upgrade of the audio-visual facilities at The Clarence Hall, which is the biggest event venue in the centre of town and used regularly by townspeople and businesses, as well as the regular Cosy Cinema. The improvements include a new DVD/Blue- Ray player and an upgrade of the induction loop used by people with impaired hearing. An up-to-date and reliable A/V system is seen as an important part of ensuring the Hall’s future as a community and event venue for Crickhowell. COMMUNITY MARQUEE – Crickhowell FC + RFC – approx. £4,800. To purchase a commercial grade marquee, lighting and storage container to be used for community events around Crickhowell, including sporting events and potentially Christmas and farmers markets. This would cut the cost of hiring and could generate income for maintenance of the marquee and potentially other community projects, even if it was hired at a much lower rate to community groups. Events using the marquee would, in turn, bring visitors into town and reduce the reliance on local businesses for sponsorship of events. COMMUNITY NOTICEBOARD – Crickhowell Civic Society – approx. £2,100. To create a community noticeboard so that local small to medium-sized businesses can promote their products and/or services, community groups can advertise their activities and provide a central location for community news and issues. It would be free to all to use and discourage fly-posting of notices and large plastic banners “which many residents and community groups feel are a blight on the wonderful environment we’re so lucky to be able to enjoy in and around our town.” It would be maintained by the Civic Society. To replace the existing “Crickhowell” Road signs on the A40 with “heritage” stone signs like those found at the edge of Llangattock or some Valleys towns. The new town edge markers would, according to the applicants: “Announce Crickhowell as a place of some status, feature, and fame. These signs would certainly improve the aesthetic of and about Crickhowell and provide a greater impact for all approaching travelers.” Each sign would allow logos for local organisations like the Green Man Festival, Walking Festivals, etc. to be placed on a side surface, alongside a more visible and attractive Crickhowell (+ Welsh) town name. FOUNTAIN – Natural Weigh and Dean Christy – £2,000 contribution sought. To restore the fountain at the top of Crickhowell High Street to provide free drinking water. 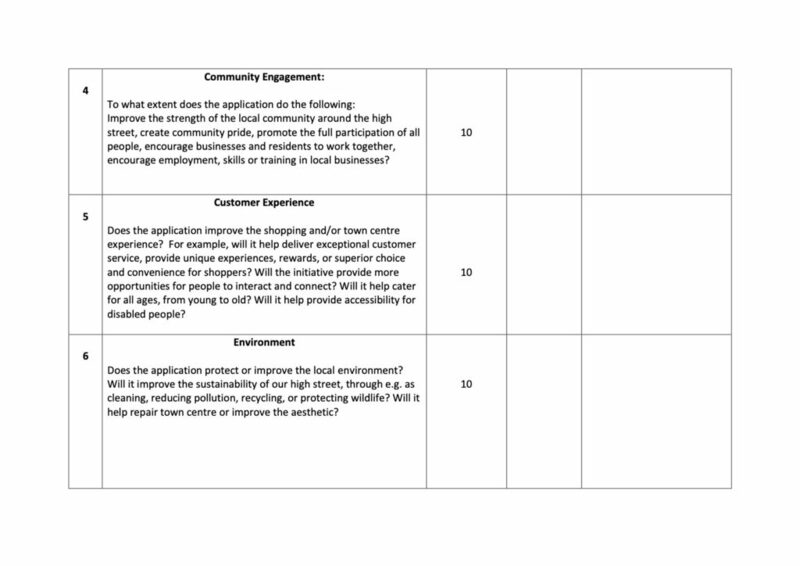 This, the applicants say, would improve the attractiveness of the High Street and encourage people to use reusable bottles, reducing the number of single-use drinking water bottles finding their way into the environment and adding to Crickhowell’s claim to be plastic free. The applicants say they would return the money to the fund if the idea could not be made to work. STATUE – St Edmund’s Church – a contribution of £5,000 sought. To help pay for the restoration of an important statue in St Edmund’s Church, which attracts thousands of visitors every year. The effigy of Sir Grimbald Pauncefote now only consists of a number of broken parts, and it is proposed that these parts should be fixed in their appropriate positions to create a better representation of the effigy as a whole. Without it, this historic statue will continue to deteriorate. With the restoration “the story will come alive,” says the Church – especially when a digital intranet is installed to allow visitors to explore the story of the Church and Crickhowell online. TOUCH SCREEN – CRIC – approx. £2,500. 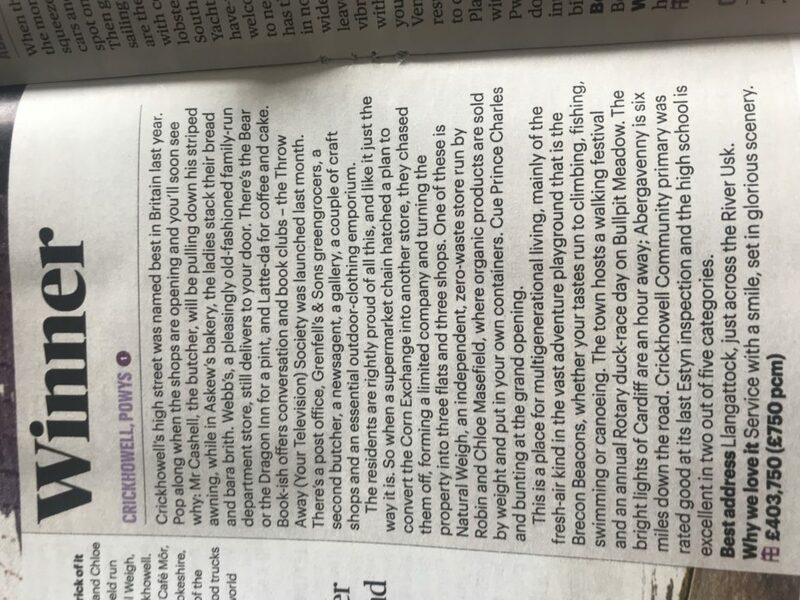 To design and install a physical map of Crickhowell to show visitors the location of shops around town, including businesses off the High Street in the Courtyard and on Bridge Street. The Map would be placed in a waterproof case in the main Car Park and could also include symbols for other town features such as Information Point, ATM, Water refills, B&B, etc. Finger point signs would also be installed to guide visitors to The Courtyard Shops and increase footfall. They say affordable businesses premises are needed because the High Street is full. VISITOR GUIDE – CRIC – approx. £2,500. Tie in with Totally Locally and Crickhowell Black Mountains Tourism initiatives to produce a printed Visitor Guide/Directory which represents shops and businesses and capitalises on the GBHS win. The guide will be designed in a format that can be easily updated in future and is transferable to a digital platform. To establish a Youth Club for school-age children which would be held on Friday nights in the Parish Hall. A maximum of 40 children will be permitted to attend. The club would aim to forge links with local businesses and volunteer organisations and offer valuable skills to young people. All those helping to run the youth club will have new or renewed enhanced DBS checks. The bid includes 1 year’s rent, the purchase of equipment such as a First aid kit, a fold-up pool table/associated balls/cues, crafts resources and materials, Music/DVD player, Monitor screen/tv, etc. Activities will those suitable for children with learning needs or disabilities, and this will be supported by the Magic Parent Group network. By walking around the town with paper petitions, creating online petitions and encouraging people who are on social media to vote online, these groups have all passed the threshold of 100 votes required to go through to the next round. All the applications have sponsors and rough costings and are ready to go forward if they receive funding from us. We will be notifying all applicants of alternative sources of funding should they be unsuccessful. The Brecon Beacons National Park’s Sustainable Development Fund have offered support and help with wording applications for theirs and other award schemes. In line with the process we outlined at the start of this process. The applications will now be considered by a representative advisory panel made up of different groups who work to make the town better, along with people from different sections of our community, including people who were born and bred in the town, young people and disability campaigners. They will be scoring the applications against this score sheet, which was made available to all the applicants and sets out the criteria of the competition. This process has been approved by the Great British High Street organisers. 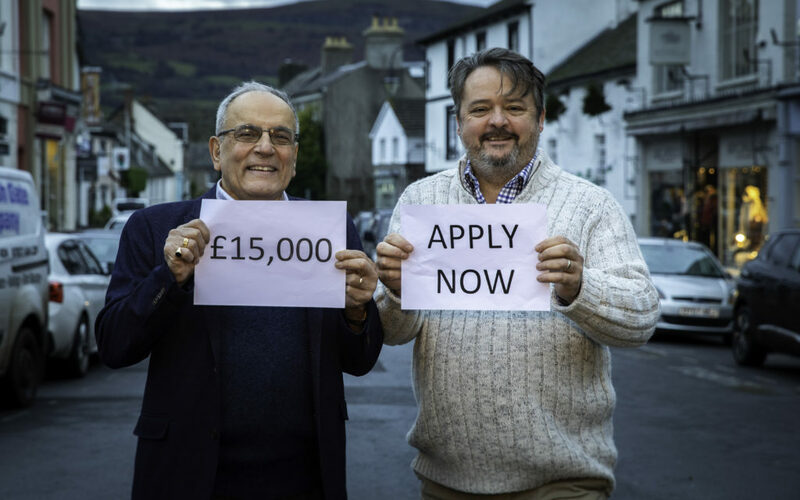 Community projects have until midnight on Friday to apply for a share of the £15,000 prize won by Crickhowell in the Great British High Street competition. They have to submit a proposal and rough costing to Corn Exchange Crickhowell Ltd, who entered the competition on behalf of the town. They also have to secure at least 100 votes to demonstrate public support for their project. Groups have been posting petitions online and in local shops. “It is obvious that we will receive more applications than we have money for. We will be suggesting alternative sources of funding and we recommend that applicants look for some, too. They have done the hard part: they have come up with the ideas, done the research and garnered public support. Even if they don’t get the money from us, there are lots of other pots of money for community projects and they should not give up on turning their ideas into reality,” Tim said. Applications to the High Street Fund must meet similar criteria to the original competition: improving the community, environment, customer experience and/or use digital innovation to support the town. The organisers also want schemes which will have a lasting impact on the town. 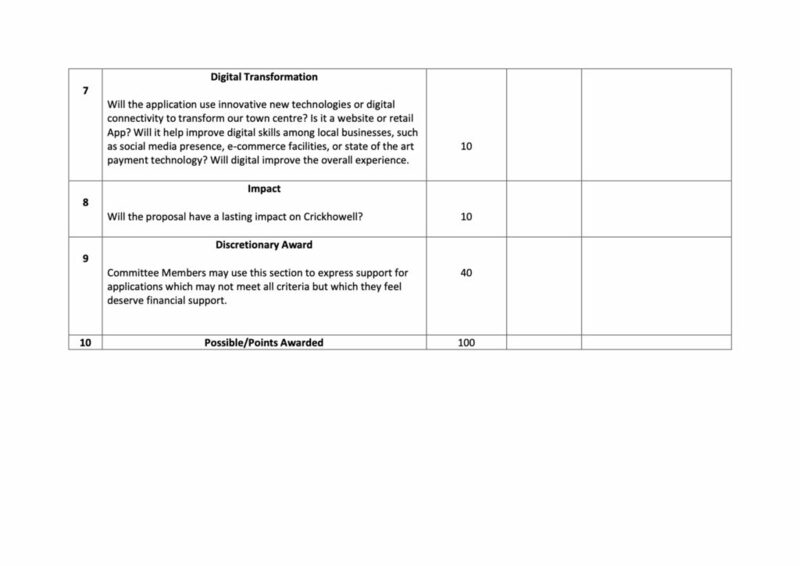 After achieving 100 votes, applications will be judged against this score sheet. 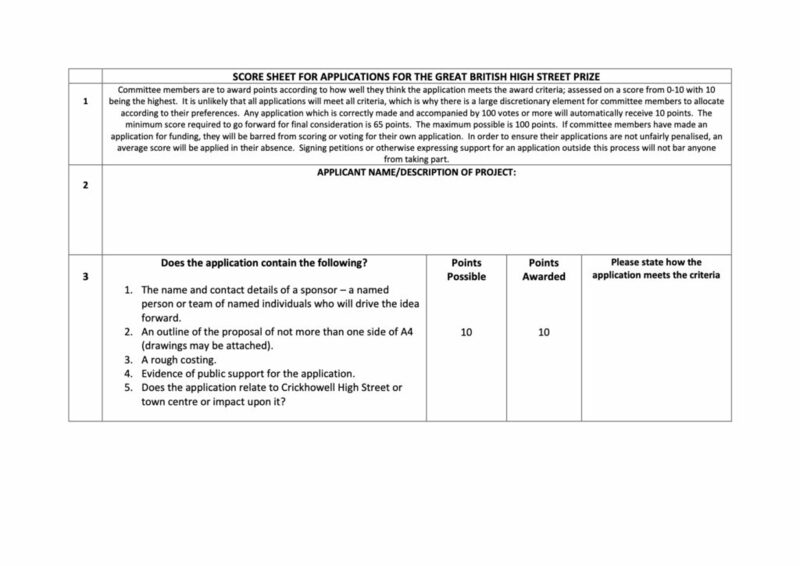 There is just over a week left to apply for a share of the £15,000 prize money won by Crickhowell in the Great British High Street competition. Local people have until midnight on Friday, January 25th to submit an application for the money. Corn Exchange Crickhowell Ltd (CECLtd), who ran the town’s successful bid, have published criteria which applications must meet in order to be considered for funding. Any ideas must promote community engagement in the town, improve the environment of the town centre, bring a better customer experience and/or use innovative digital solutions to benefit the town centre. They will also need to have a lasting impact on the town. “Petitions have been distributed around town, and people are getting an opportunity to support the applications as they come forward – it is a real competition of ideas.” He said. A committee of local people has been established to help CECLtd decide who should get the money. They have been selected from all sections of Crickhowell society with ages ranging from 16 to 70 plus. Once the deadline on January 25th has passed, the applications will be collated and passed to committee members, who will rate them against a scoring sheet which allocates points according to the competition criteria. A summary of the applications, omitting personal details will be published. If this scoring process fails to produce a clear winner or winners, a meeting of the committee will be organised to help CECLtd reach the final decision. CECLtd say they hope to have the final results in early February. There are just over three weeks to go in which to make an application for funding from the £15,000 Great British High Street prize money. Only written applications submitted by January 25th will be considered. You can find out full details of what you need to do to apply on this link. A committee which is broadly representative of Crickhowell is being set up to judge the applications. As part of this, we are particularly interested in hearing from a young person aged between 17 and 20 who would be willing to help us judge the applications. Please message us here or email info@cornexchangecrickhowell.co.uk if you wish to be considered. Our process has been discussed with the organisers of the competition and we have given them an undertaking to feedback with the results. Below is the scoring sheet the committee members will use. Please Share this post so as many people can apply as possible.